How much is too much to pay for a prized bull elk hunting permit? One Pennsylvania elk hunter forked over $52,500 in a raffled permit to support conservation efforts by the Rocky Mountain Elk Foundation. The hunter’s identity was not disclosed in a press release announcing the permit, which was purchased back in January during a silent auction. As part of the permit, the hunter will be allowed to hunt a bull elk through an extended season. The Pennsylvania Game Commission also held a raffle for 116 elk licenses – just 21 for bull or antlered elk – at the state’s annual Elk Expo. Close to 28,000 hunters purchased tickets for the raffle, amounting to nearly $280,000. Another raffle for a single bull elk permit raised more than $157,000 for the Keystone Elk Country Alliance. The winner of that raffle will be afforded a guide, lodging, their hunt filmed by a professional video crew and a free shoulder mount of the bull. 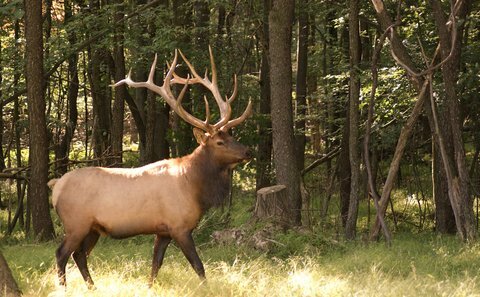 The funds comes as Pennsylvania has grown its elk population to about 900. Historically high numbers of elk in Pennsylvania were over-hunted by early settlers resulting in their near elimination by the 1870s. By 1981, after nearly 70 years of attempting to reintroduce the herd, elk numbers were still at just 135, but by 2000 had reached 566, according to Lancaster Online.